Big Ben was cast on 10th April 1858, the Great Clock started working on 31st May 1859 , and Big Ben first chimed the hour on 11th July 1859. The bell itself is officially called the “Great Bell”, but gets its nickname from Sir Benjamin Hall, who became the first Commissioner of Public Works in 1855 and oversaw the later stages of the rebuilding of the Houses of Parliament. The previous Palace of Westminster had burned down as a result of the Great Fire of 1834. The Great Bell was cast with Sir Hall’s name inscribed upon it. The “big” part comes from the fact that the bell weighs 16 tons and is about 2.1 meters (7 feet) tall. The bell cracked however, and had to be replaced by another one weighing 13 tons. 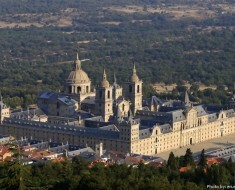 It is situated some 61 meters (200 feet) up the belfry. The tower is officially known as Elizabeth Tower, renamed as such to celebrate the Diamond Jubilee of Elizabeth II (prior to being renamed in 2012 it was known as the “Clock Tower” or St. Stephen’s Tower). The size of Big Ben (including the tower) is 96.3 meters (315.9 feet). That is equal to about 16 stories. The first 61 m (200 ft) at the bottom are comprised of brickwork and Anston limestone cladding. The rest of the tower is made up of cast iron. 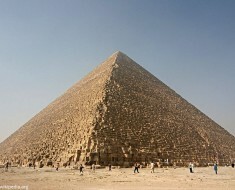 The tower is set on a square raft measuring 15 meters (49 feet). The raft is made up of concrete 3 meters (9.8 feet) thick. It is 4 meters (13 feet) deep underground. 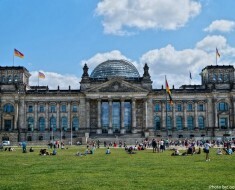 The clock faces are about 55 m (180 ft) over the ground. 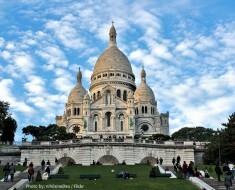 Measurements show the inner volume is 4,650 cubic meters (164,200 cubic feet). The tower’s interior is not usually open to the public except on certain occasions. To reach the top one must climb 334 steps. There is no elevator installed. 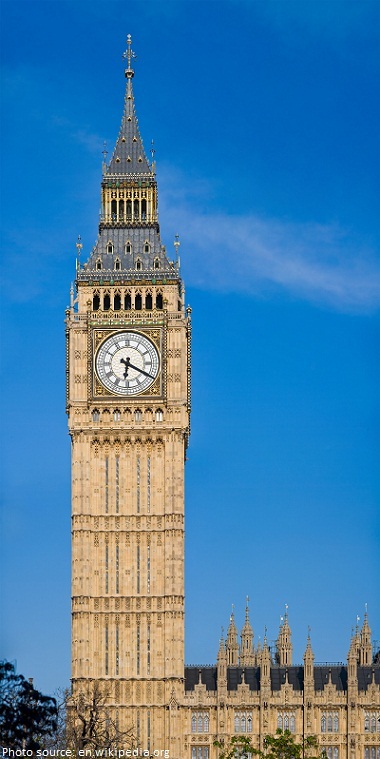 Big Ben’s clock is the biggest four faced clock on the planet. The hour hand is 3.2 m (8 feet) long. By contrast the minute hand is 4.3 meters (14 feet) long. The clock dials are set in an iron frame 7 meters (23 feet) in diameter, supporting 312 pieces of opal glass, rather like a stained-glass window(on each side). Each clock face has an inscription in Latin in gold that reads “DOMINE SALVAM FAC REGINAM NOSTRAM VICTORIAM PRIMAM” or “Oh Lord, keep safe our Queen Victoria the First”. The clock and dials were designed by Augustus Pugin. The clock mechanism itself was designed by Edmund Beckett Denison, who was not actually a clockmaker, but a lawyer. Every year the clock is adjusted using an old English penny. If the clock is running fast, a penny is added to the pendulum. If the clock is running slow, a penny is removed from the pendulum. The clock gains 2/5 of a second a day from each penny added. 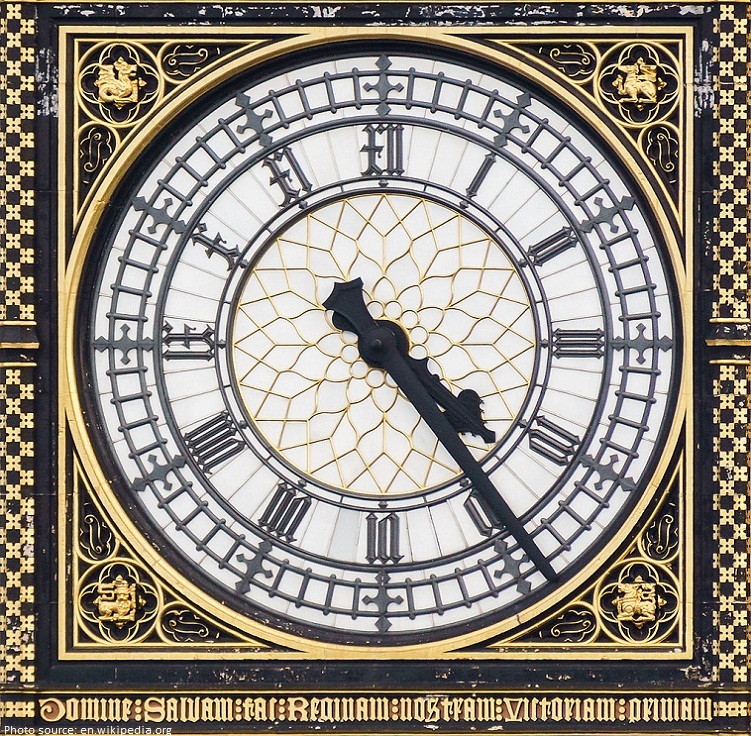 The first radio broadcast of Big Ben’s chimes was to ring in the new year of 1924. Naturally, it rings in the new year every year for London. 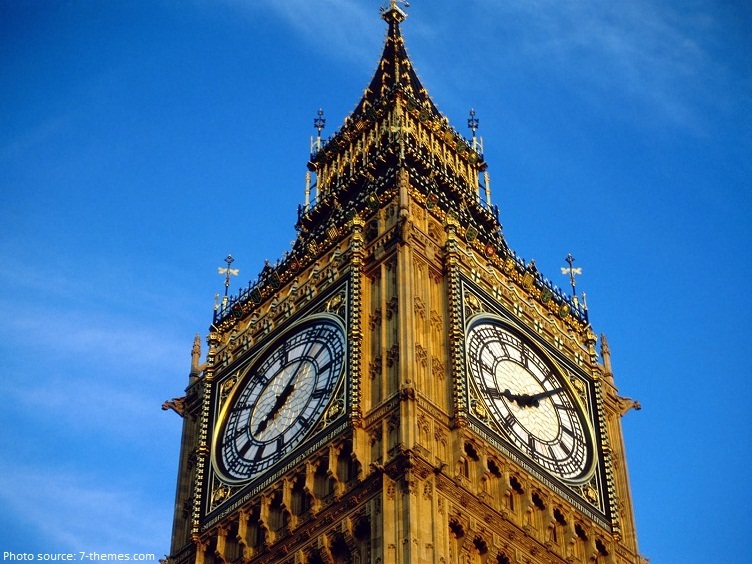 Big Ben chimes every fifteen minutes and can be heard for up to 8 kilometers (5 miles) around. 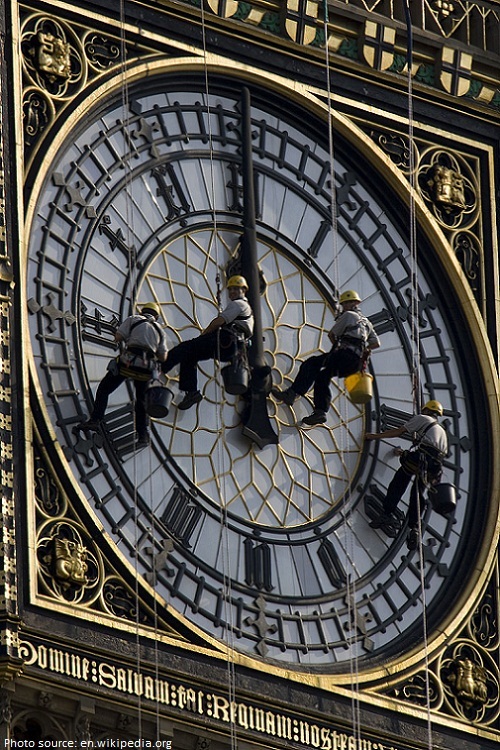 The clock faces are cleaned every 5 years using.A group of window washers rappels down the belfry down to the faces and have to be careful not to break the glass panes or lean on the hands. The clock tower is actually a little slanted and leans slightly towards the northwest by 8.66 inches. This is due to some tunnel excavation close by. Since 2003, it tilts by almost a millimeter per year. 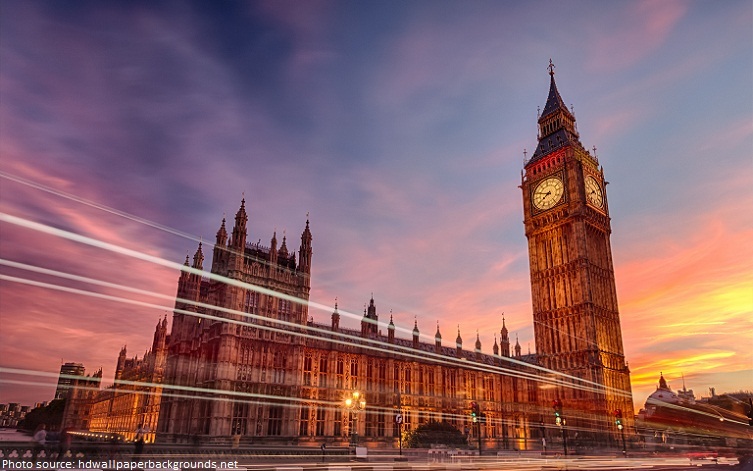 Six million people visit London each year, and most of them will visit Westminster and see the clock tower. In 2008 a survey of 2,000 people found that the tower was the most popular landmark in the United Kingdom.